PITTSBURGH -- The Colonials celebrate a victory over RIT (David Auth/RMU Sentry Media). ERIE, Pa. — The Robert Morris University men’s hockey team (10-20-2, 9-15-2 AHA) will look to finish their Atlantic Hockey regular season campaign on a strong note as they host their I-79 arch-rival the Mercyhurst Lakers (13-16-5, 11-11-4 AHA) in the first game of a home-and-home between the two teams, starting Friday night in Erie, and finishing with the second game on Saturday night on Neville Island. 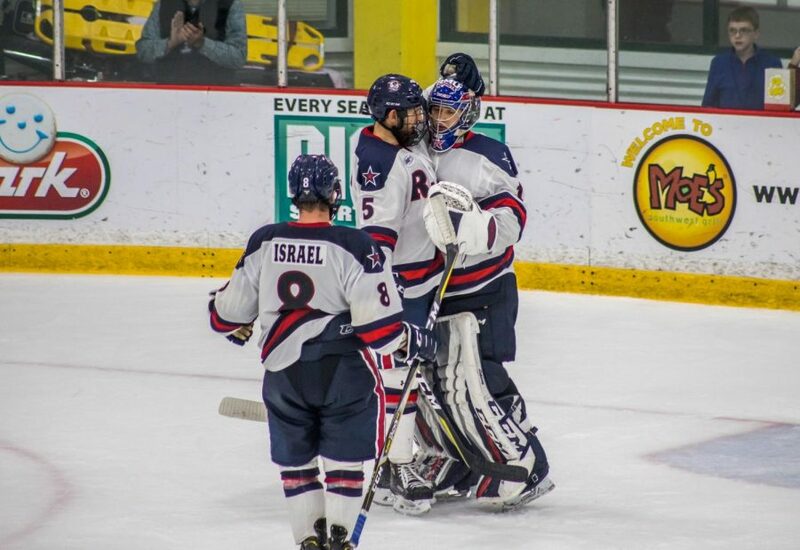 Despite a rough last half of the season, RMU will be looking to make an impact heading into postseason play. To do this, they will need crucial contributions from veterans and young guns alike in order to try and make a deep run all the way back to the Atlantic Hockey Championship game. Before these two familiar foes square off to end the season, let’s take a look at how each side has done down the stretch and what will be key for either side to come away with a victory. The Colonials are coming off a rough go of things last weekend against the RIT Tigers, losing the first matchup 5-3 and then being forced into a tie, 2-2, in game two despite leading for a majority of that game. Justin Addamo put the puck in the back of the net twice for Robert Morris over the weekend’s span, and Alex Tonge, Michael Louria and Aiden Spellacy also notched goals in the tough setback decisions. The Colonials will need to come out of the gates flying in both of their games against the Lakers, with solid efforts from both their younger players and their grizzled veterans like Tonge, Louria, and Luke Lynch, in order to get the wheels turning into a more positive outcome as AHA playoffs begin with first-round series next week. Mercyhurst currently sits three spots above RMU in the standings in 7th place and are coming off a tie and loss of their own this past weekend against defending Atlantic Hockey champions Air Force. The Lakers tied the Falcons 3-3 in game one but fell in game two, 4-2. Josh Lammon, Matt Whittaker and Joseph Duszak found the back of the net for the Lakers in game one, while Tommaso Bucci and Taylor Best scored in the loss in the second game. The Colonials will need to contain the offensive powerhouses that are the aforementioned Duszak and Derek Barach in order to have any chance of getting a sweep this weekend. #24 Alex Tonge (RMU): The leading scorer for Robert Morris in his senior season, Tonge has strung together an impressive 14 goals and 15 assists for 29 points throughout the year. Tonge is an incredibly sneaky forward as he is able to maneuver around the defense with relative ease if given time and open space. The Colonials will need a huge offensive output from a veteran like Tonge to give them a firm shot at winning either game this weekend. #21 Justin Addamo (RMU): The native of France has made an immediate impact during his first season as a Colonial. While he has only amassed 11 points (6G, 5A), what sets Addamo apart from his teammates is the raw physical power that he possesses with his height and size that makes him a dual threat on both offense and defense. Do not be surprised if Addamo’s physical play and checking ability lift Robert Morris in the final regular season weekend. #21 Joseph Duszak (Mercyhurst): Dusak has been an outright monster offensively for the Lakers this year, leading the team in scoring with 16 goals and 27 assists. The Colonials must keep an eye on Duszak at all times in order to not allow him to get any decent scoring chances or open looks at the net. #1 Stefano Cantali (Mercyhurst): The sophomore netminder out of Montreal, Quebec has been stellar in net this season for the boys in green and white. 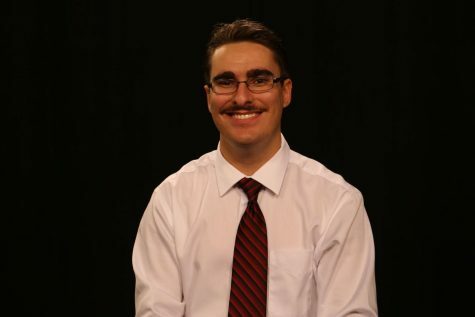 Despite what looks like a middle-of-the-road goals-against average at 3.06, Cantali currently holds an outstanding .904 save percentage just slightly better than RMU goaltender Francis Marotte. While the matchup will be interesting to see if the two Canadians go at it in both or just one matchup, the Colonials will need to pepper Cantali often in order to break through his staunch play that he has possessed for most of the year. I think that Robert Morris will finally get over its losing skid and breakthrough in both games to end the regular season of the AHA on a winning note, sweeping the Lakers 4-2 and 5-3. Considering the score of the second time these teams met this year, where RMU thumped Mercyhurst by a 7-1 score, I believe that Tonge, Louria, Lynch and others will make a much needed offensive push that will overwhelm their rivals and will put RMU in a positive mindset heading into the postseason.